Hello there, remember me? I am so sorry I haven't been around for over a week. There have been a few reasons as to why but I won't bore you with those! 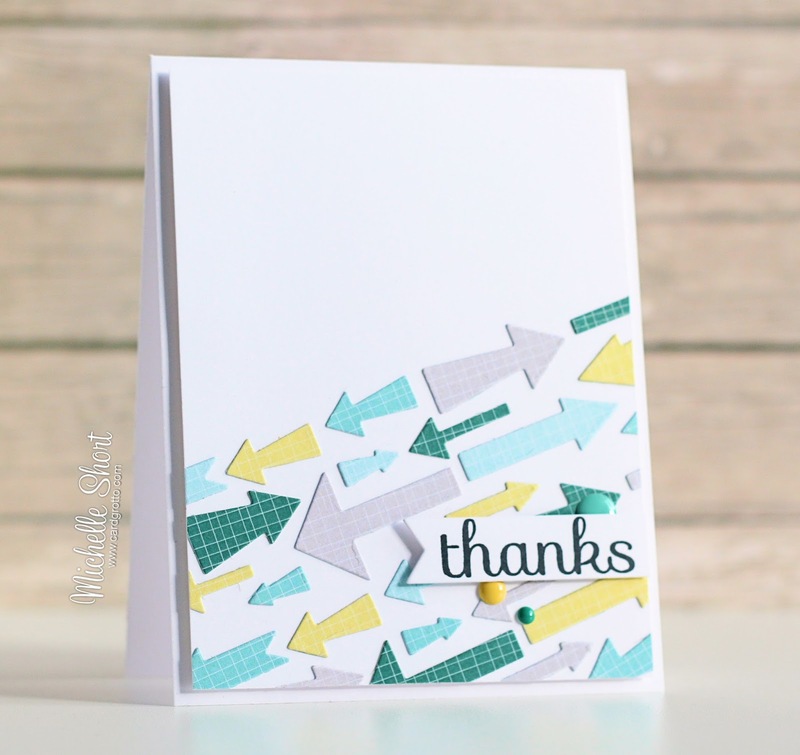 I am back today to share a card I have made using the Mod Arrow Border die from Simon Says Stamp. 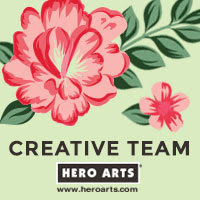 I thought it would be great as a male themed background for a thank you card. I first took the die and ran it through my Cuttlebug, cutting various sheets of paper from the Create A Smile Feel Good Paper Pad. I love these colours together. I then went to work adding them to a panel of white cardstock, using the original die as a placement guide. 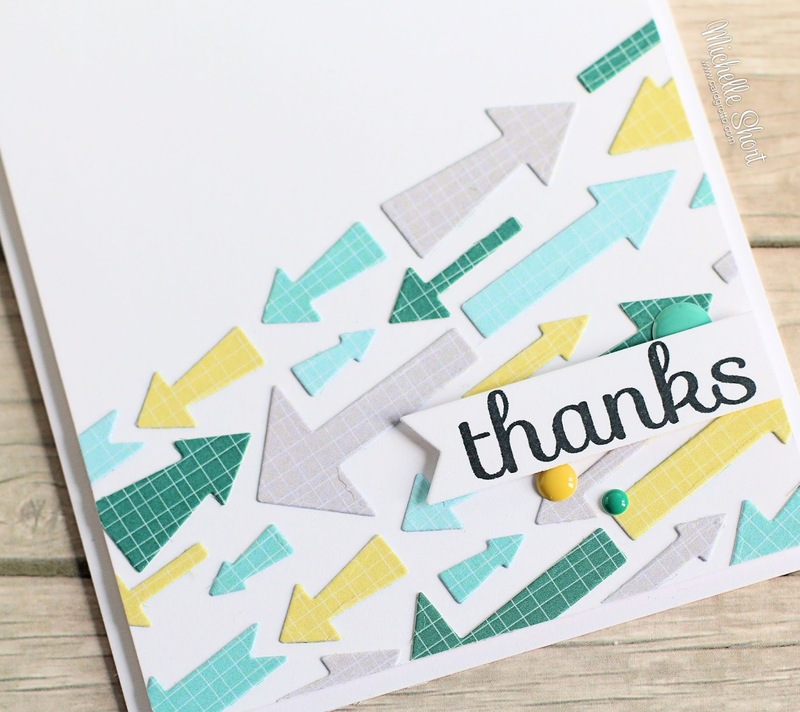 I then took the thanks sentiment from the SSS Thanks set and stamped this with black ink on to banner die from the Clearly Besotted Tag Along die collection. This was adhered with foam tape to the panel, the panel was then adhered to an A2 card base with more foam. I finished off by adding a few enamel dots. Here are the products that I used on the card. Please click on the picture to be taken to where I purchased it. Thanks so much for visiting me today, I hope you have all been well in my absence. Have a lovely day! What a fun card Michelle. It is perfect for a male card. I am thinking now that I need to order that arrow die. I love it. Glad you're back and hope you're doing ok. Such a nice card. Love the colours. Really nice and striking. 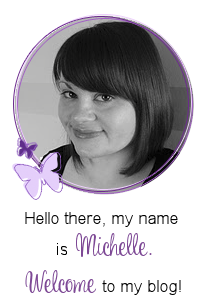 This is fabulous Michelle, such a stylish design and I love those papers.